Look at the numerous pipes below clipped to the wall and running parallel to the toy train railway track. 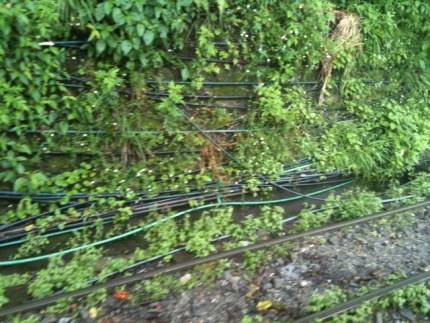 You will see hundreds of such nasty pipes, some even leaking, almost in all parts of Darjeeling. What are these pipes for? They supply water to numerous private homes who have to buy water from private sources. So does that mean Darjeeling has no municipality water supplied to homes and establishments? Well Darjeeling does have supply of municipality water which is free, but it is not adequate by any means to cater to the overall demands of water in the hill town. Why? Because the main source of water are the two lakes at Senchal (near Ghum) which were constructed during the British time. These lakes are fed mainly by spring water, and recently after completion of the Balasun river project, water from the river is also pumped into these two lakes. However Darjeeling's population was only 10,000 when the lakes were constructed to serve as water reservoirs. They were designed to cater to a population of up to 15,000. But what is the scenario now? Darjeeling town now has well over 1,32,000 residents, and there is a large influx of tourist population (some 30,000) that gets added at any point of time during the high season. But no water storage capacity has been added since the British era although population grew in leaps & bound. Apart from the two Senchal lakes, there is however another one - Sindhap Lake which too serves as a reservoir. It is fed by the mountain stream Bangla Khola. But this hardly makes any difference to the water crisis in Darjeeling. Other than the low capacity of the lakes which is far below the actual requirement, the water distribution system in Darjeeling has also virtually collapsed. The original municipal distribution is through underground pipes fed by overhead water tanks which are filled up with water from the lakes. But this distribution network of water pipes have not kept pace with the widespread growth in localities and population. As a result, there are numerous pockets and areas in Darjeeling, who get limited water supply, and many do not get water at all from the main supply. They need to depend on river streams nearby. However there are some areas which do get water 24 hours a day. And over time due to malpractice, the distribution systems have been manipulated to divert water by the miscreants. As a result of all this, you see those horrible looking pipes running along the walls and grounds almost everywhere. These are the individual water connections provided by private parties offering water supply to private homes. Many homes must pay to such private sources and get a water connection. And these pipes can run for miles. You will be surprised to find the level of low water pressure that residents have to live with. I once opened the tap in one of my friend's home... water was barely trickling out. And that's all the water they get for the family of five. When it comes to the hotels, most need to purchase water from private sources. Water is delivered in large plastic tanks. You can see trucks unloading filled up tanks at hotels and loading empty ones early in the mornings. Can the water woes in Darjeeling come to an end? Yes, only if they increase the storage capacity (by constructing more lakes to hold water), and also revamp the distribution system. But it can take a long time.